There are systematic methods available for determining when one should stop reading a book. If a book hasn't grabbed me by page 100, for example, and there are other signs I'm not going to like where a book is going, I'll stop reading. Another one of those tests is the Page 99 test, which I talked about in the next post. The idea is what if page 99 of a book isn't gripping in some way then you should take a pass on the book. Personally, I've not always found this to be the case. How do the rules apply to short stories? There are other factors which come into play nowadays that maybe didn't apply as much back in 2008 when I wrote those posts. One is the whole 'free' thing. Back in 2008, the indie movement, Amazon's Kindle, and eBooks in general hadn't taken off like they have today. 'Free' wasn't the marketing tactic it is today, either. Nowadays it's not unusual to have a Kindle full of free eBooks. I give these books much less consideration than I should and certainly less than something I paid $2.99 or more to purchase. Fact is, I give up on these books quite readily if they don't do something really quickly to keep my interest. It's no secret that I'm no longer a fan of freebies, so maybe I'm just biased in this regard. The other factor which influences when I might choose to stop reading something is similar to free. That is low price. As in 99 cents or even up to $2.99. Anything $2.99 or less is really no big deal if I buy something I wind up not liking. I wouldn't want to do it too often—$2.99 a pop adds up after a while—but my time is worth more than such a small amount of money. This was not the case years ago. I'd finish something no matter the cost. But with age comes less patience, at least for me. It's part of that whole "I'm not getting any younger" mentality. Then there's the usual factors which keep me from finishing something. You know, characters I can't identify with, storylines too cliché or already done to death, bad mechanics (spelling, grammar) on the part of the writer, or stories that explain, explain, explain. That last one really gets me sometimes. I'm reading Maelstrom by Taylor Anderson and while I really liked the first two novels in the series, this one is dragging with all of the repetition of what's come before. Too much telling and not enough stuff happening. I honestly don't know if I'm going to read the next book in the series if this one doesn't have a real good ending. So what factors make you give up reading something? There are many rules for quantifying when one should stop reading a book if one is finding said book not so appealing. There's the 100 page rule, the 150 page rule, the 33% rule, and, last but not least, the Page 99 Test. There's a new site just going into beta that wants to showcase the last of those rules. It's called Page99Test.com. People in bookstores often read page 99 of a book to get a taste for the writing - to determine if they'd buy the book. Same goes here. Writers upload page 99 of their manuscript, and you get to read & rate it. Tell writers if (based on reading page 99) you'd buy their book. You can sign up for alerts via email regarding the roll out of the beta, and, in fact, I received an email this morning notifying me that they will be selecting 100 private beta users from amongst the people who have signed up for alerts to get things started. I've done the Page 99 Test on my own writing before. The idea of putting a Page 99 out for all to see and rate, while very cool, can also be a bit daunting for some. It's that fear of rejection we all have to varying degrees. But we as writers have to get our writing in front of objective audiences at some point. This is a bit narrow of a focus (only highlighting one page), but it serves the same purpose. I'm eager to get my own page 99's up, and to see what others post. A multi-part series where I address the question, When to stop reading? So far in this series I've looked at various rules and quantifiable methods one can use to determine when it's time to give up on a book. I applied the 99 Page Test to my own novel. Finally, and most recently, I looked at when to give up on a short story. This time I'm going to break away from the printed word and take a look at audiobooks. 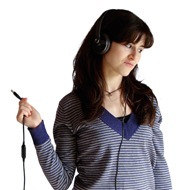 Audiobooks are not without their controversy. The debate of audio vs print is older than the digital age (think cassette or even 8-track tapes). Yet we often hear about how people are reading less and less and how the digital era spells the doom of the printed book, so maybe audiobooks through their inherent convenience might become a lifeline for some people who might otherwise never experience great literature again. Nevertheless, audiobooks are not so different from their printed counterparts when it comes to the question of sticking with it or stopping. So, at what point do you quit listening to an audiobook? What are the rules (other than just your gut feeling, of course)? 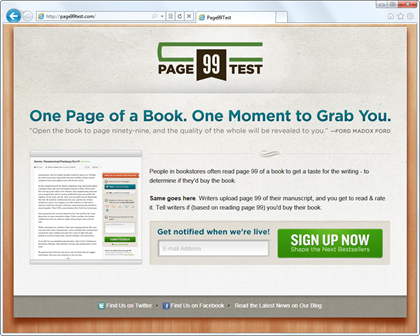 Tests like the Page 99 Test aren't going to work for obvious reasons. Neither is the Rule of 50 or the similar 100 Page Rule going to cut it. The 33% Rule, perhaps. You just need to count the number of discs (or tapes) or look at the total running time and divide by 3. If you hit that threshold and the audiobook ain't doing it for you, time to hit 'eject' or 'stop' or even 'delete' if you're that disgusted with it. To answer the question, I'm going to do something different. I'm going to turn it around and instead ask what keeps you listening to an audiobook. They understand cadence, and adjust the pacing of their reading to reflect the story’s inertia. If they do voice work, they do it well. […] they sound like they care about and are invested in the work. I couldn't agree more. The very first audiobook I ever listened to was Neil Gaiman's Anansi Boys, narrated by Lenny Henry. Henry did an excellent job. The best thing about his narration was his use of voices. When reading dialog, there was no question as to which character was speaking. Not only that, but the voice which Henry chose to use for each character is in itself a storytelling device because each illuminated my perception of that character. It's something you just don't get when reading a story yourself. Yet this can have the opposite effect, too. I recently listened to Dragons of the Dwarven Depths, narrated by Sandra Burr. This one almost lost me when she started in with the raspy voice of the draconians. It sounded forced and I found it borderline annoying. Fortunately it was a small part in the beginning, and since I'd bought the audiobook from Half-Priced Books I only had a few dollars invested. I kept listening and (quite to my surprise b/c I loathe Weis and Hickman's writing style) I enjoyed the story. There's also the quality of the recording. Though I have yet to listen to an audiobook that did not have "professional" level quality, with more and more amateurs recording their own audiobooks and making them available as quick downloads this may play a bigger role moving forward. Of course, there are the usual factors, too: the quality of the storytelling (as written by the author), the choice of dialog, the characters, setting. These will always be amongst the best qualities of great storytelling regardless of the medium. With that, I'm curious what others think. What qualities keep you listening to an audiobook? Or do you not listen at all? This is part 3 in what's become an ongoing series on when to stop reading a book. Each post stands alone, but feel free to read part 1 and part 2 before jumping into this one. "At one point do you give up on a book?" "At one point do you give up on a story?" Short stories, whether standalone or as part of a compilation, fall into the 'when to stop reading' conundrum just like novels. Especially those which infringe into the length territory of novelettes. The further we get, and the more our frustration grows, the more likely we're going to put (or throw) that book down. For purposes of this discussion, I'm going to use an example: The Solaris Book of New Fantasy. TSBONF is a compilation of shorts by such notable authors as Mark Chadbourn, Janny Wurts, Jeff VanderMeer, Chris Roberson, Lucius Shepherd, Steven Erikson, and others. I just finished the book, so I'm at a good point to discuss it's highs and lows. In particular, there were stories I stopped reading simply because they were going nowhere or just weren't holding my attention. 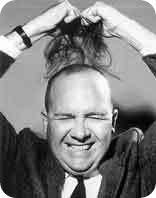 Some people say you have thirteen lines in which to hook the reader of a short story. I found this to be more or less true as more often than not I knew just by looking at that first page whether or not the story was going to hold my attention. It's not a hard and fast rule, of course, but it's often easy to get a good feel for what the story is about and if it's your cup of tea. In the following list I'm going to use some clever graphics to indicate whether or not I finished the story. "Thumbs up" means I finished. "Thumbs down" means I flipped through the remainder of that story and went on to the next one. A quick tally shows that I finished ten out of the sixteen stories in TSBONF, or 62.5%. Six stories remained unfinished, or 37.5%. I don't know what ratio indicates I didn't waste my money. I read ten stories, most of which I enjoyed. I remember a couple leaving me a little dissatisfied, but nothing like the sheer "WTF is this about?" I thought as I skipped through the six stories I did not finish. For me, this is a lesson. Not only in what I like to read, but also what elements keep someone from putting a book down. I can only attempt to instill such elements into my own writing. As always, I'll end with a question: What makes you put a book down? A while back I blogged about when to stop reading a book. As the post detailed, there are many criteria, not the least of which is your own good judgement. But there's also quantitative measurements one can take, including the Page 99 Test. I decided to try the test on my own book, The Hall of the Wood, which I've offered as a free download for some time now. For purposes of the test, I'm going to start at the first paragraph on the page, so I'm leaving out about 2-3 lines at the top. Murik raised a finger to his mouth and whispered, "Shh." The man trembled as he sat up and pushed himself backward. There was nowhere for him to go, though, as he backed into the wall. Murik knew he had found Graewol, for the man looked every bit the crazed lunatic Relk had made him out to be. He wore only pants with no socks or shoes, and his hair was a greasy black and gray with no order to it. His untrimmed beard shot off in all directions. Murik held his hands out to the man. "I mean you no harm." The sorcerer's voice soothed him as his trembling lessened. "Are you the one they call Graewol?" The man's chin rose, then went back down. He repeated his nod over and over, stopping only when Murik spoke again. "My name is Murik. The citizens of this town say you are a wise man who knows many secrets." Graewol smiled. "Ah know many. Many ah do. Secrets, secrets ah know. All the secrets." "I need to know of only one this night, my friend. Can you tell me a secret about the lands around Homewood?" Murik tread lightly, not wanting to unduly upset him. "Secrets, secrets, ah know the secrets..."
The first thing I immediately had to resist was the desire to clean it up a bit. I've noticed as I edit my current novel (The Five Elements) I'm much more judicious, and I dare say merciless, in chopping out unnecessary words, consolidating character movement, and just being more concise overall. But none of that is the point of this post. The point of this post is to determine if my page 99 makes The Hall of the Wood a worthy read. I'm biased, no doubt, but I like what I see there. There's a certain amount of intrigue and mystery, and hopefully a desire on the reader's part to want to know what secret Murik is after. I'd flip to page 1 and give it a try. So, for me, The Hall of the Wood passes the Page 99 Test. Agree or disagree, let me know.